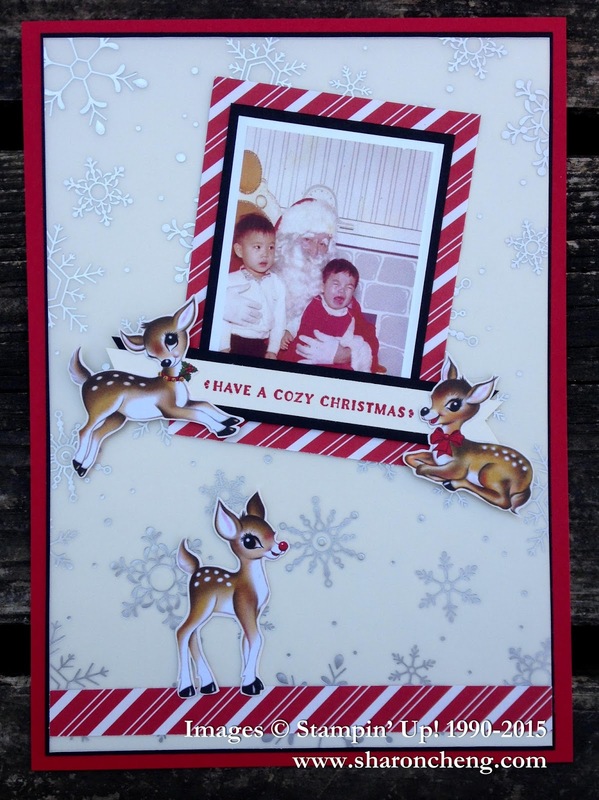 The November Splitcoaststampers Creative Crew Challenges were all about Christmas and the Children (and the Child Within). One of my favorite things about making Christmas projects is how you find yourself smiling while you are crafting. It's fun making them and then watching someone's face when they unwrap your homemade gift. One of my friends call it a paper hug. I love how that describes the love that is shared when you give a gift from your heart. The snowman and Christmas tree ended up being my favorite project even though it didn't turn out the way I originally planned. 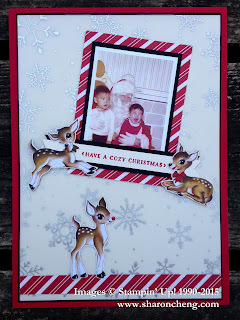 I used the Bohemian Designer Series Paper (138446 $11) and loved the results. It's a good thing I like all different color combinations for Christmas! Here is the tutorial for the project. This project almost designed itself. 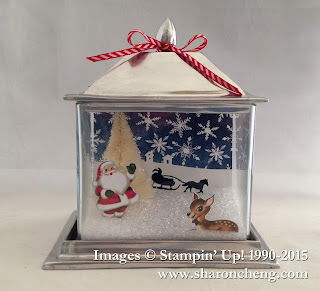 I bought the glass container at an estate sale for $2 and knew I wanted to make a Christmas scene using the Santa and reindeer from the Home for Christmas Designer Series Paper (139592 $11). The Sleigh Ride Edgelits Dies (139670 $19) were perfect for the background. The snowflakes are from the Season of Cheer Designer Series Paper (139590 $11). The leftovers from the Christmas scene project above inspired me to make this ornament. 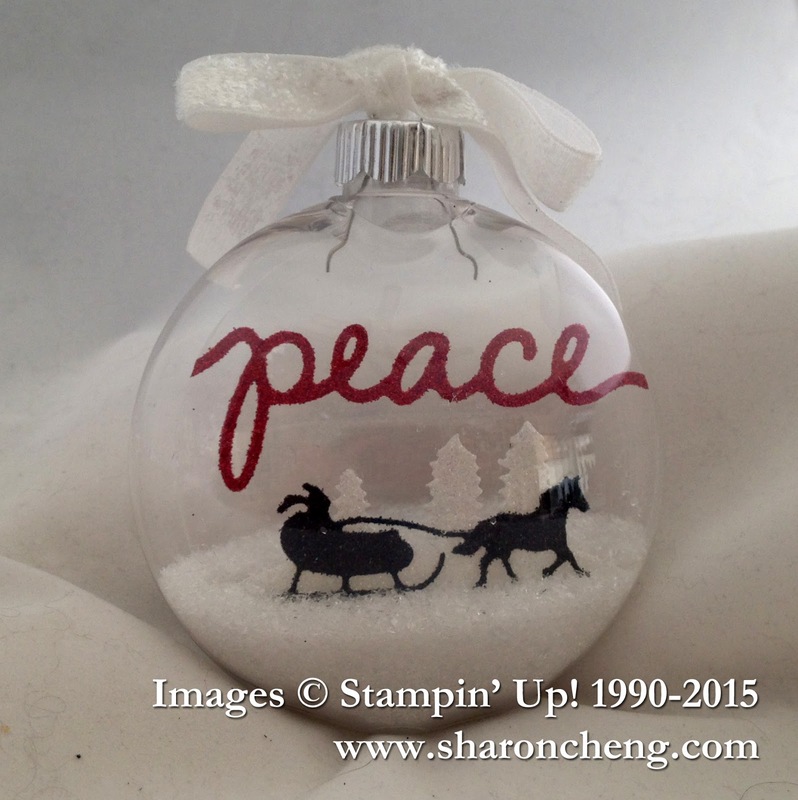 Here are the details for making this Christmas ornament. This picture of my brother and sister with Santa makes me laugh. Notice how Santa is the only person looking at the camera. I can't imagine how my mom felt wanting to get the perfect photo and then ending up with this one! However, this photo has triggered many more Christmas memories than our other "picture perfect" childhood photos. This scrapbook layout is designed to fit the 6 x 8 Project Life Photo Pocket Page (135297 $6). 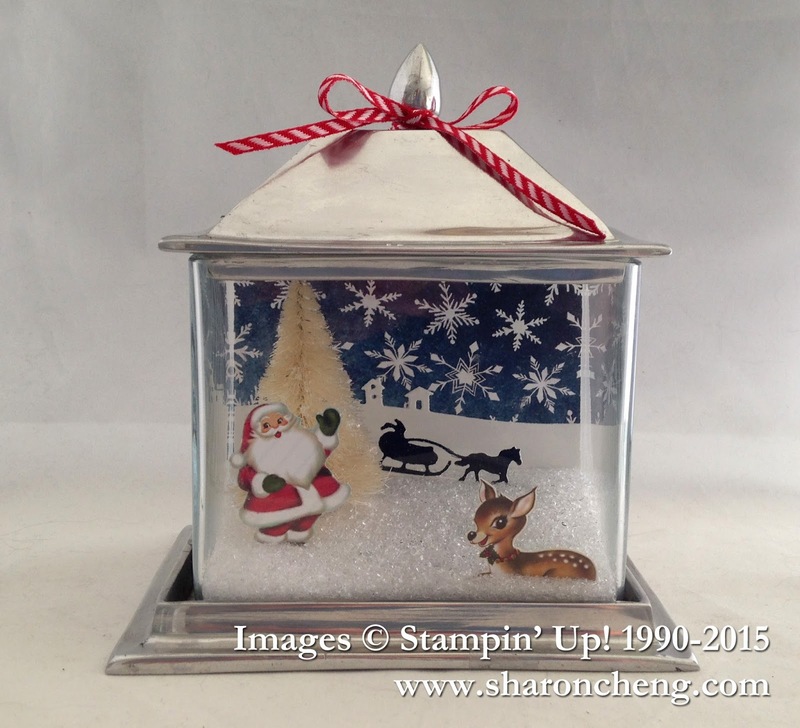 It uses the Home for Christmas Designer Series Paper (139592 $11) and Holidays Fancy Foil Designer Vellum (139597 $11). 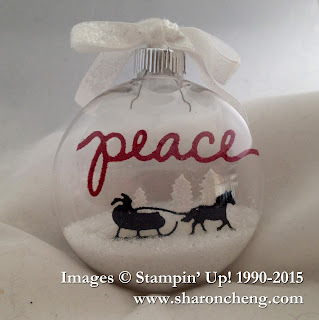 For more Christmas inspiration using Stampin' Up! 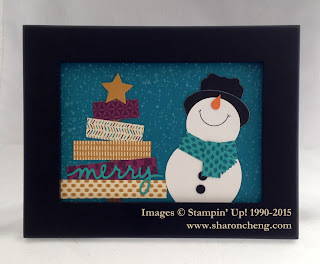 products, be sure to visit the Creative Crew Gallery on Splitcoaststampers.